Local children are digital ‘Trailblazers’ thanks to WheelWorks! Nearly 50 local children have taken part in an innovative, cross-community digital tourism project, thanks to youth arts charity WheelWorks. 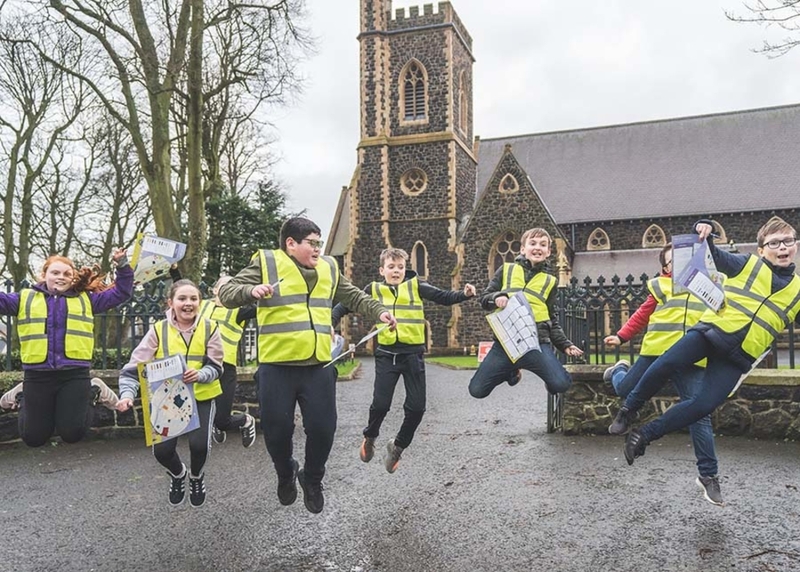 Funded by the Executive Office, as part of the 2018/19 Central Good Relations Funding – Good Relations Capacity Building Pilot through the Building a United Community (TBUC) programme, the Trailblazer project saw pupils both Clough and Mary Queen of Peace primary schools work together with WheelWorks artists to create a tourism app for their local area over a period of 12 weeks. The Trailblazer tourist app consists of a walking tour of both Clough and Martinstown and details the commonalities in the areas such as history and heritage, flora and fauna and other wildlife. The children were responsible for collecting video footage, interviewing local people of interest, taking photos and collecting artefacts and then digitising them with the help of WheelWorks artists to create a tourist app that can be used to enhance any local person or visitor’s experience of the area. “The Trailblazer project has brought a range of benefits to the local community. The children worked together with a real purpose whilst building good relations across the two areas and learning new skills such as technology, orienteering and teamwork. The community volunteers developed their skills in community facilitation, addressing issues of diversity and good citizenship and also achieved a Prospect Award in Digital Creative Media and good relations as well as achieve a Volunteer Award. The Trailblazer app was officially launched at the Adair Arms in Ballymena in front of funder, children and parents. To download the Trailblazer app and find out more about the hidden stories of Clough and Martinstown, search ‘Trailblazer app’ on the App Store. For further information about WheelWorks, visit the WheelWorks website.